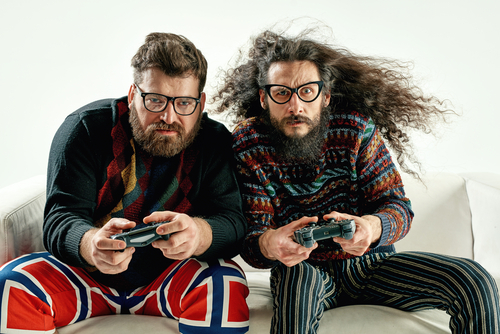 Are videogames really that bad after all? Videogames have been very popular with both adults and children since the time of their invention. Their popularity has never decreased; rather they have increased with the devleopment of playstations. Videogaming has taken on a new turn with the development of LAN games, many of which were full of violence. This had raised concerns about its effect on the young and worries that excessive videogaming may lead to addiction and violent behaviours in children and teenagers. But new research shows that this is not so. Video-games are just like other things and habits we have: it has both beneficial and not so good sides. Excessive playing of video-games can of course lead to addiction and negative effects on one’s health. But what about the other side? Videogames are a great way to expand the creative part of your mind. Most videogames are challenging and the latest ones are becoming tougher and tougher to crack. There are problem solving skills which need to be used to crossing each level. Thus, playing video games sharpens the mind skills. Playing it regularly helps your brain work and build new connections about new ways of doing things. It helps you sharpen your reflexes and logical thinking. It helps you to think things in step-by-step and orderly fashion, which is required to solve most issues. Puzzles and strategy based video games are excellent in this. Want to ace your motor skills and strategic thinking? Get your hands on the latest gaming station now! It teaches you patience and endurance. You learn to persist on achieving your goals, no matter how difficult it may be or how long it may take. Giving up is not an option as it leads to frustration. Instead, it forces you to try more and more harder. As you cross each difficult level or hurdle, to move to the next stage, the sense of achievement it leads to is amazing. In addition, it teaches you to deal with repetitivity and regularity. In real life, many of us tend to get bored or understimulated and this may lead to us not completing our given tasks properly. One of the things which playing videogames teaches you is to accept regularity and discipline yourself to it. This will help you to ensure long, boring, repetitive tasks which you may have to do as part of your work. This is vitally needed for academic work. Another important quality it develops in a player is the power of observation. You have to really be a good observor especially in games where you have to identify objects or actions critical for that game to complete. Sustained and regular playing will sharpen your observation skills, which again will help a student in his real life. Observation skillsare required in object based games, where you have to locate missing objects or items which are disguised very well in the scenery. Other important skils which are enhanced through videoplaying includes vocabulary, map reading and identification, thinking ahead. So, definitely, playing video games enhances many skills required in life but as in all things in life, control is necessary. Self-regulation will bring out the best in any habit. If your essay is on a topic related to video games and you would like some help with it, you can get all the help you need here.